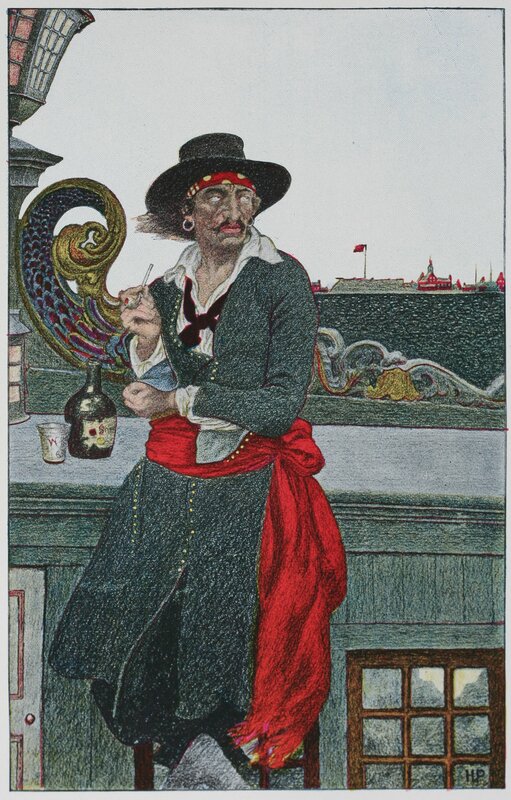 Captain Kidd is one of the most notorious pirates of all time. Yet all his “pirating” was done during a single voyage to the Indian Ocean that lasted from 1695 to 1699, and there may not have been any pirating at all. Many people believe that Kidd was a lawfully licensed privateer, who never captured a ship that he was not authorized to attack. Kidd, however, is the only pirate to have buried treasure. William Kid was born in the town of Dundee, on the Scottish border, in 1645. His father was a ship’s captain, who was lost at sea, and the family live on charity during Kidd’s early years. Popular belief is that the young man went to sea when he was 15, but no historic details confirm this. 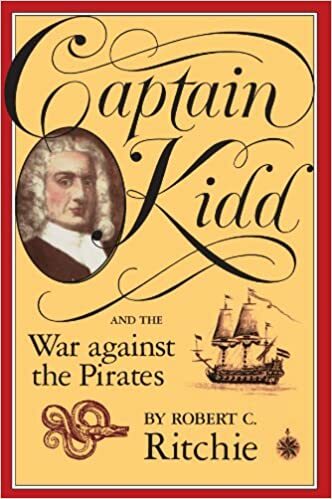 The first solid evidence about Kidd comes in 1689, when he is mentioned as a member of a privateering crew during the Nine Years War. Kidd’s ship captured a French vessel and sailed it into harbor on the island of Nevis, then an English colony. The governor of the island responded by re-naming the captured ship the Blessed William and giving command of the vessel to Kidd. Whether this was because of Kidd’s family connections, his level of education, or simply because he was a persuasive man, we do not know. Whatever the reason, it was Kidd’s first command. He defended the island, then joined an English squadron raiding a French sugar plantation. As was usual with privateering vessels, the cash and goods captured in the raid were divided to pay Kidd and his crew. The proceeds made Kidd a wealthy man, and lined the pockets of his crew comfortably. The privateers were next required to join the squadron in standing up to equally well-armed French ships. This was a far different assignment than attacking a helpless plantation. Kidd’s crew were not happy, told their captain so. Kidd’s response was that they should do as instructed, for King and country. The crew responded by mutinying, stealing the Blessed William, and carrying off the valuable cargo. Kidd was assigned another ship, the Antigua, but then he disappears from history for a year. He next surfaces in New York City, then the second largest town in North America with a population of just under 5,000. There Kidd met and married Sarah Bradley Cox Oort, a woman twice widowed and very wealthy. The two lived very comfortably together for five years, and Kidd became a member of the highest level of society in the city. Five years later, in 1695 Kidd became involved in a privateering mission to attack pirates in the Indian Ocean. We have no idea what motivated him. Perhaps he was tired of his wife’s company. Perhaps she was tired of his. Or perhaps Kidd was himself approached. We simply don’t know for sure. The plan was sketchy from the beginning. England was still at war with France, and her international relationship with India had not been good since Henry Avery had attacked a ship carrying a member of the Indian royal family. In addition, pirates inspired by Avery were harassing the East India Company, while at the same time flooding English markets with gold and jewels which may or may not have been Arabian. So, some of the highest placed men in England planned to build a mighty pirate-hunting ship, captain it with a man of know capabilities, and set it loose in the Indian Ocean, to capture pirate ships and hang wrong-doers. The plan was also to re-acquire plunder taken by the pirates, at a tremendous profit to captain and crew, but more especially to the scheme’s backers, who would fund 80% (£6,000) of the venture while remaining safely in England. Kidd sailed to England to sign papers and receive his privateering commission. The deal, drawn up by some of the most powerful men in England, was not a standard one. In a normal privateering venture, risk was assumed by everyone. Under Kidd’s agreement, if the venture failed to produce a profit, he himself was liable to repay his bakers. It was also required that the names of the backers remain secret. He also needed to come up with the other 20% (£1,500) not something that privateer captains were usually required to do. The profits from the venture were to be divided so that the first 10% went to the King, exchange for Kidd’s Royal Commission, and of the remainder, 60% was to go to the anonymous backers, 15% to Kidd and Livingston (the man who had brokered the deal.) The last 25% to be divided among all he members of the crew. Kidd’s problem was that he didn’t have £1,500. Livingston, however, also did not want to be caught out if the expedition failed. He introduced a wool merchant named Blackham, who was willing to provide a loan of the upfront money in exchange for 1/3 of Kidd and Livingston's shares. Once again, Kidd signed highly dubious documents, in complete secrecy. Kidd’s commission, issued by King William himself, instructed Kidd to attack pirates, to attack the French, and to refrain from harming the King’s subjects or allies. Kidd was to leave on his mission as soon as possible, and return by the end of January, 1696.